This page on calculating derivatives by definition is a follow-up to the page An Intuitive Introduction to the Derivative. On that page, we arrived at the limit definition of the derivative through two routes: one using geometric intuition and the other using physical intuition. On that introductory page, I used Δx instead of h. Now I will be using h because it is easier to manipulate it algebraically, and we'll be doing a lot of manipulations. Let's examples of how to apply this definition to actually calculate the derivative of a function. The derivative of a constant is zero. This is a very important fact that you will use all the time. And it makes intuitive sense also, both geometrically and physically. 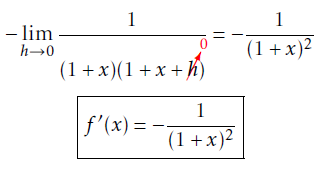 The derivative gives the rate of change of the function. As the constant doesn't change, its rate of change equals zero. Geometrically, the graph of a constant function equals a straight horizontal line. Hence, its slope equals zero. The derivative of x equals 1. The derivative of x² is 2x. The same rule applies for differences, because we can think of a difference as a sum in disguise. Pay attention to the factors highlighted in pink. These are powers of h, that will approach zero as h approaches zero. The etc represents a bunch of terms that have higher powers of h in the numerator. This is the hardest proof we have done so far, but it is very important. 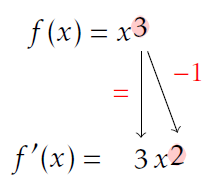 This rule includes the special case of f(x) = x² that we calculated earlier. Let's try to understand how to apply this rule. This rule is somewhat similar to the rule for logarithms of powers: you take the power "down", and then lower the power of x by 1. Let's do one more. This one can't be calculated using the power rule. Now, here are some problems for you to solve. First there are some problems where you'll need to apply the power rule. Then there are some problems where you'll need to use the definition to find the derivative of some functions. If you have doubts or want to discuss a problem, leave a comment below. Find the derivative of the following polynomial functions using the power rule. 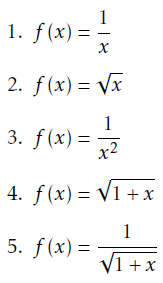 Find the derivative of the following functions using the definition.